This post contains affiliate links. I will receive a small commission for products purchases through these links. I appreciate your support! Hi friends! A lot has happened since I last posted on here. First things firsts, the Muscaris are now Tennesseans! We sold our house in Illinois in June and moved to Franklin, Tenn. Needless to say, things have been a bit crazy for me unpacking and settling into a new home. I finally had a little down time and was able to wrap up a video tutorial of the last project I did in our old house. My husband scored this amazing dumpster dive find back in April, a Pottery Barn table! I gave it a farmhouse spin, and it's now our new kitchen table. I'll give you a few details down below, but check out the my video to see how to create this look for yourself. I did a new finish for me on this table top using Varathane Premium Fast Dry Wood Stain. in the color Sunbleached. It's a beautiful finish that gives you that driftwood look that is gray but also lets some of that natural wood goodness shine through. I've worked with this stain before, but this was a new color for me. It is super pigmented, so I only had to do one coat, and it dries fast too. I used my new go to topcoat to seal it, General Finishes High Performance Top Coat in Flat. For the apron, I used the same technique I did on my last kitchen table makeover. I painted it with one coat of Annie Sloan Chalk Paint in Old White and distressed the whole surface with a 400 grit sandpaper. I love this paint so much because there is no need to sand or strip your furniture. I didn't seal it with wax or topcoat because I love the chalky finish the paint has, and the apron doesn't get the wear that the table top does. I did the same finish on my last kitchen table, and it held up pretty well with my kids who are some of the messiest people alive. I just use warm water to wipe it up. All these shots were taken in our old home in Illinois. It looks even better in our new house in Tennessee! More projects are on the way! I can't wait to share them with you and some shots of our new home. And don't forget to subscribe to my YouTube channel, so you don't miss any of my tutorials and reviews. This post contains affiliate links. I will receive a small commission for products purchased through these links. I have wanted to make over my kitchen table into a farmhouse table for a while now, but I wasn't quite sure what I wanted to do with it. 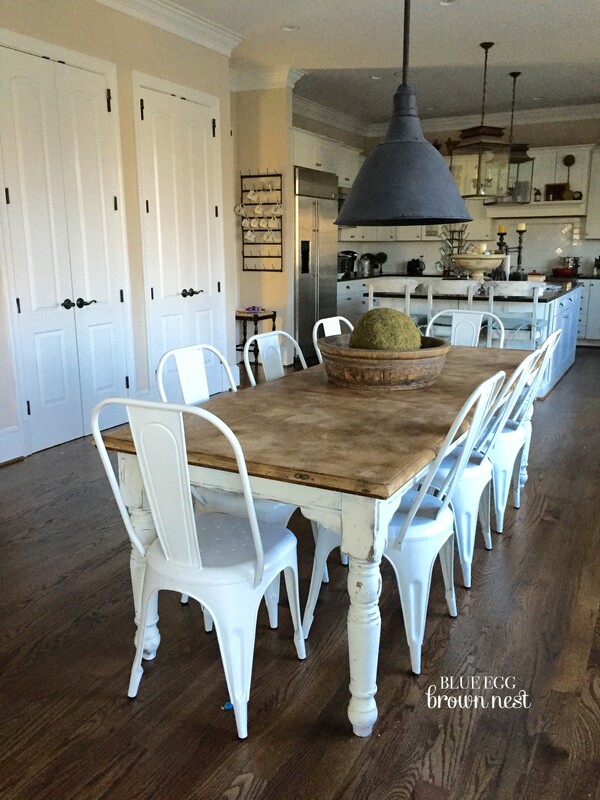 Then when I was reading one of my favorite blogs, Blue Egg Brown Nest, I fell in love with her kitchen table transformation. I knew I wanted something very similar, so I set to work. My inspiration courtesy of Christen Bensten at Blue Egg Brown Nest. Here is what I was starting with. We bought this table from the previous owners of our home in Indiana. They were downsizing, so we were able to purchase a lot of their furniture at a great price. This table was in really good shape, but I was never a fan of the table top's finish. It was too orange for my taste, and the varnish was very dull which means it did not wipe up well. The chairs were pretty oversized and looked a little out of place in our small dining space. And here she is now- light and bright. I just love the worn, farmhouse look of the table with the white metal chairs. It totally fits with my white kitchen, and I love the contrast it creates with my dark stained island. I would love to tell you how easy this project was, but I am into telling the truth on this blog and not whitewashing (pun intended) the details. I decided I wanted to try to strip off the black paint on the apron and legs of the table, stain it a weathered oak color, and then do a coat of white paint on top. I wanted natural wood coming through versus the black. This turned into a big mess that I will save for another post where I will talk about using chemical paint stripper. To be honest, I am still scarred from this process, and it is just too soon to talk about it without getting red in the face or breaking out in tears. So let's jump ahead. Here is my table stripped down to bare wood (or as close as I could get it). I used my Dewalt Orbit Sander for the table top, and it worked beautifully. It only took me about 30 minutes to strip the whole top using a 60 grit sandpaper disc. After I was done, I wiped it down with a tack cloth and went over the table again with a 220 grit sandpaper disc and wiped it down one more time. My table top is a veneer which means there is a very thin layer of wood on top of a pressed board or particle board, so I had to be careful not to sand right through the veneer. After using two different chemical paint strippers and my orbital sander on the apron and legs, this is as close to natural wood I was going to get without losing my mind and my nose hairs. Stripping paint off of wood that was raw at its application, especially black paint, is pretty impossible, but let's save that for another post. I am starting to get angry, and you wouldn't like me when I am angry. To stain the base of the table, I used Varathane Wood Stain which is a new product for me. It is really different from Minwax stain which is what I typically use. It is thicker, almost paint like and works a lot faster. I wiped it off only a couple minutes after I applied it. I was pretty nervous at first because the Varathane Early American was very different from Minwax Special Walnut. It was super orangey, but a coat of the Varathan Weathered Gray mellowed it out quite nicely. Phew! While my stain dried, I tackled the table top. I used the same technique Christen from Blue Egg Brown Nest used on the inspiration table, dark wax on raw wood. She got this idea from another princess of paint, Miss Mustard Seed. They both used Miss Mustard Seed's Antiquing Wax, but I decided to use Annie Sloan Dark Wax because I already had some. I took a hammer and screwdriver to the table top before I applied the wax to give it a distressed, worn look. I also left some of the spiral dents from my sander on the table. I applied the wax pretty unevenly to give it a farmhouse look and then wiped down the excess with a lint free cloth as I went. The color is just perfect! The dark wax on raw wood has such a beautiful patina.This was the most satisfying part of this project by far, and since the wax works as a sealant, I did not use a protective coat like a polyurethane or polycrylic on top of it. After I let the stain dry for 24 hours, I did a very light coat of Annie Sloan Chalk Paint® in my go to color, Old White. Once that dried, I did some light distressing with 220 grit sandpaper to get some more of that natural wood to show through. Since I worked so hard to get that weathered oak color, I didn't want to completely cover it up. I decided not to wax the base at all and left it chalky just like the inspiration table. I finished off the look with six white metal bistro chairs from Amazon at a great price. They wipe up so easily which is just perfect for my season in life with my three little mess makers. We have been using the table for about a month now and the finish is holding up which is something I was worried about. Since it takes 30 days for the wax to cure, I made sure to not keep anything on the table for an extended period of time. It wasn't that hard. We just would clean up right after we ate and did most of our projects and homework at the counter. I am only using hot water and maybe a little soap if needed to wipe up the table. This might freak you germophobs out. I don't have raw chicken on my table, so I am okay with not wiping it down with a disinfectant or chemicals. I think it is okay to use a Clorox wipe if need be every now and then. I just don't want to over do it. This was a project a long time in the making, but I am really pleased with the results. Do you have a table you would like to turn into a farmhouse dream? Does this post scare you or inspire you? I hope inspiration wins out in the end! I am so pregnant, but I managed to sneak in one more client job before we welcome this baby to the fold. Today, we will be looking at a makeover I did for a client who just bought her first home. She is looking to make it her own without breaking the bank and wanted to start with this table and benches she got from Walmart.com. I know some of you might be skeptical about buying furniture from Walmart, but this set is really well made and all wood at an affordable price. Honestly, it is a great set as is, but she wanted to give it a little more character, so we decided to lighten and distress it up. The result is a cozy, little farmhouse table. The top of the table had a great butcher block finish, so we decided not to touch that and just focus on the apron and legs. As with all my client pieces, I used Chalk Paint® decorative paint by Annie Sloan. We went with one of my favorites and a classic, Old White. Followed with lots of distressing with a 150 grit sandpaper and finished off with Annie Sloan Soft Wax in clear. I used a tiny amount of a 1:1 mix of Annie Sloan Soft Wax in dark and clear on the detailing of the legs of both the table and benches to make the aging and distressing look more natural. Cutting the dark wax with clear softens the look as opposed to using it at full strength. I highly recommend this when applying over Old White or your piece may become too muddy. I love the way the detail of the legs pop once you lighten them up. The black hid those beautiful curves. What do you think? Are we crazy for painting a brand new piece? We don't think so! Update: I recently filmed a video comparing wax and General Finishes High Performance Top Coat that is comparable to Polycrylic. Check it out. I have another client reveal to share with you today. This is the second job I have completed for her, and again she brought me a gorgeous family heirloom. She grew up eating at this table. Now, she gets to gather around it with her own little ones and make some new memories. out and used a medium sandpaper, 80 grit, to smooth it out. which I know you see a lot of on my site, but it truly goes with anything. It has so much more depth than your average pure white, and also really helps dark wood shine through when you are distressing. , I decided since this is a kitchen table going into a home full of toddlers, that a durable polycrylic sealer with a Satin finish would be the way to go. I did three coats, and the key to getting a smooth finish with no streaks is a quality brush. Seriously, spend the extra $3 by only buying a brush in the "best" category or you will not be happy. The polycrylic does give a glossier look than wax would, but I was really happy with its clarity- absolutely no yellowing! I did wax the legs of the table and the combination of sealers really worked well. The piece still looks cohesive, and my anxiety level is way lower knowing my client will be using this table multiple times a day. I think I am still "Team Wax," but for really heavy traffic pieces I would promote using a polycrylic sealer. My client sent me a pic of her whole family around the table enjoying a big Father's Day Breakfast yesterday. What a joy overload, seeing something like that makes all the hard work worth it. Are there any other Chalk Paint and Poly fans out there? I would love to know are you "Team Wax" or "Team Poly?"